Do you think anyone is ever prepared for a new baby? Maybe if you've done it 6 or 7 times you've got it all down, but I don't know if I could ever be fully prepared. While that is the case, we're excited to think that we're finally prepared when it comes to having everything we need. That's only because we found this today. I was having a bit of a last minute, 'Am I sure?' moment about the whole stroller thing today. There are so many combinations and possibilities, and I just get overwhelmed when I start to read reviews. After thinking through what we'd like to have in a stroller and a car seat, we decided to go into Target while we were out to try some out. Sadly, that was something we hadn't really done. 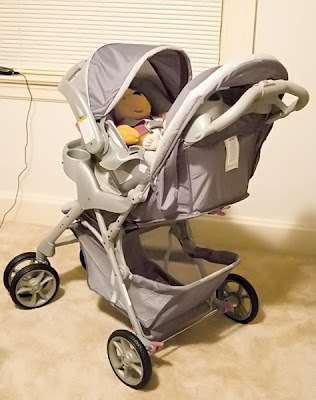 Anyway, we found one that was much easier to maneuver than anything we've had before that came with the infant seat and base, and it just happened to be reduced. So we now have a way to get the baby home from the hospital, and I guess we are ok if he decides to make an early appearance. Jonathan has been having fun giving his animals rides, and I have to admit he even tried out the stroller to see how it rides. Don't worry. he's still under the weight limit. Just wanted y'all to know that we are thinking of you and praying for you! I'm excited to see what name y'all have chosen and to see pictures of the new baby! Crystal....like the stroller. I sent your husband an E-mail to forward it to you....did you get it?